In the store building materials you can buy mosaic tiles, which are made in the form of a sheet. The pieces of mosaic glued to a mesh or paper based. On the basis of a certain way matched pattern of multicolored rectangles. The beauty of the tiled surface depends not only on the artistic aspects, but also on proper surface preparation, adhesive and grout. In order to glue the mosaic , you need to prepare the surface. It should be clean, smooth and dry. Sand surface to obtain a white background. On the prepared surface of the guide lines that will help position sheets. To this end, lay the leaves on the floor. Measure the size of the three neighbouring sheets. The leaves lay so that the distance between them was equal to the distance between the pieces. Copy the size on a work surface. Using the plumb line, apply the mesh. The wall will split into several squares. Squares correspond to nine sheets of mosaic. 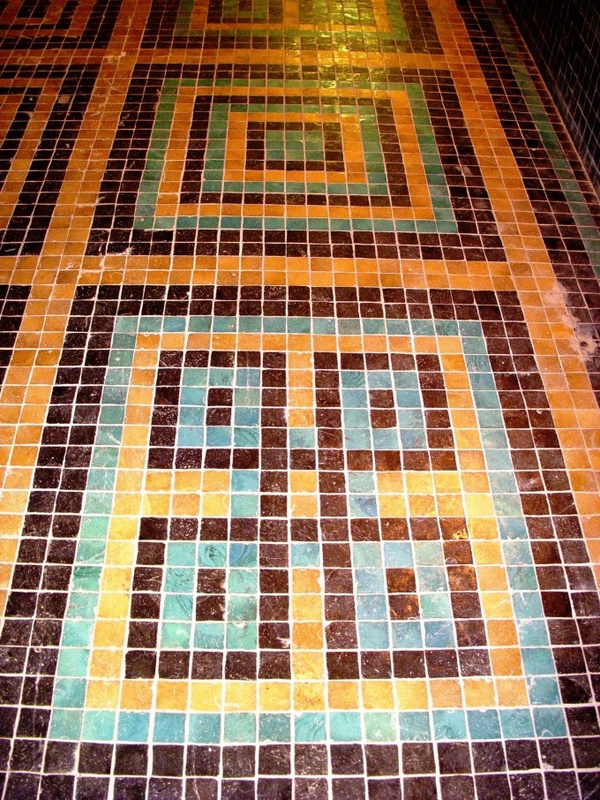 For laying mosaic use a glue based on latex, which is resistant to humidity and temperature changes. Do not use adhesive mortar for ceramic tiles. Apply glue to the surface of the comb with V-shaped teeth 5 mm. Apply smeared movements forward and backward. Hold the comb at an angle of 30 degrees to the surface. At the same time lightly press on the edge of the comb to the glue filled all the voids and pores of the surface. Do not cover the entire surface at once, and only a small area. Smooth the glue flat side first, then the notched side. On the reverse side of the mosaic also apply glue for better adhesion with the surface. Apply glue only on the tiles, not on a paper basis mosaic. Take the sheet from the mosaic tiles and place them on the surface of the paper side out. Align it and press to the wall. To do this, use the trowel the trowel or brick hammer. The joints carefully inspect and, if necessary, lightly tap on them. This is done to ensure that after installation turned out smooth surface, and formed air bubbles between the tile and the adhesive. After gluing mosaic tiles, remove the paper sheets. To do this, take a damp sponge and wipe with paper. Try to do this very carefully so as not moved the tile sheets. Wait for the darkening of the paper from moisture. Remove it by pulling it diagonally down. Remove the paper immediately after laying the sheets of mosaic. Then you can trim the seams until the glue has dried completely. Once removed, the cloth or paper you need to fill in the gaps between the mosaics. Apply a grout with a spatula in the longitudinal and transverse direction. Remove excess grout with a spatula and after 20 minutes clean the surface of mosaic tile with a damp sponge.